Two unidentified Los Angeles Railway cars head in differing directions in this junction image of an unknown location. Note the stylish Plymouth car dealership in the background. 7201 S.Vermont Ave. and Vermont Motors De Soto-Plymouth, 7223 S.Vermont Ave. and Standard Stations, Inc, 7321 S Vermont Ave., also Ralphs Grocery Company, 7813 S. Vermont Ave. in the distance. 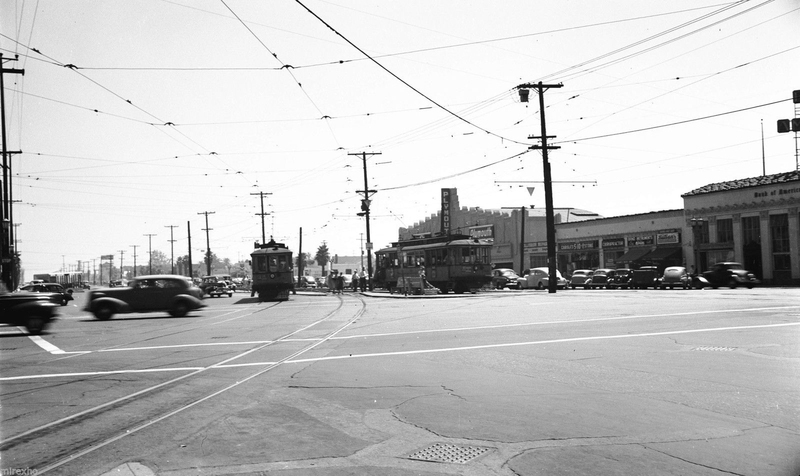 The photo was taken some time between 1940 and late 1947, when Vermont Motors moved to 7300 S. Vermont Ave. Thanks for showing it. Actually, I think this is looking north from Florence Avenue. Mr. Moulton is correct, the photo is looking to the south. If someone looked north at the intersection of Florence and Vermont, the observer would see the tracks split, the U car line on Vermont went to the north, and the F line went diagonally to the northeast as it headed to Hoover St..